As the photons of the Cosmic Microwave Background traverse the Universe, they encounter different types of structures which affect their path and energy in various ways, producing a series of observable effects. In the case where the photons pass through a galaxy cluster, a particularly interesting effect ensues: the hot, ionised gas permeating these huge cosmic structures interacts with the photons and modifies their energy distribution in a characteristic way. This phenomenon, known as the Sunyaev-Zel'dovich Effect, represents a powerful tool for detecting galaxy clusters out to high redshift. 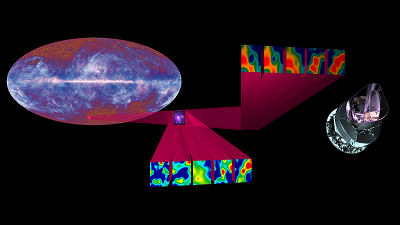 As the light of the Cosmic Microwave Background (CMB) propagates throughout the Universe, it passes through the wispy web of cosmic structure and, as a consequence, interacts with matter along its way. These interactions affect the properties of the CMB photons, imprinting a series of 'secondary' anisotropies which carry a wealth of information about the large-scale distribution of matter. Galaxy clusters, the largest gravitationally-bound structures in the Universe, play a special role in this context. Residing in the densest knots of the cosmic web, these vast assemblages contain up to a thousand galaxies and a large volume of very hot and ionised gas, referred to as intra-cluster medium (ICM), although the bulk of their mass is made up of dark matter. The Sunyaev-Zel'dovich Effect (SZE), named after the two scientists who predicted it, describes what happens to the photons of the CMB when they pass through the ICM and scatter off the free electrons present in the hot gas that fills galaxy clusters. These electron-photon collisions redistribute the frequencies of photons in a characteristic way such that, when looking at the CMB in the direction of a galaxy cluster, one observes a deficit, with respect to the average CMB signal, of low-energy photons, and a subsequent surplus of more energetic ones. In other words, along the line of sight of a galaxy cluster, the CMB appears fainter at low frequencies and brighter at high frequencies, with the transition value corresponding to 217 GHz. Multi-band observations of the galaxy cluster Abell 2319. The signature imprinted by a galaxy cluster on the CMB is thus twofold, consisting of both a negative and a positive signal, and a null effect at 217 GHz. This characteristic spectral feature enables astronomers to separate the SZE from all other anisotropies in the CMB by using observations at several frequencies in the microwave regime. As a result, the SZE is a unique tool for detecting galaxy clusters, even at high redshift. The signature of the SZE does not depend on the redshift of the galaxy cluster that produces it in a similar way as the light coming from a lantern and passing through an intervening lane of fog is dimmed by the same amount, regardless whether the lane is closer to the lantern or to the observer. This means that it is possible to detect galaxy clusters at any redshift — at least in theory. In practice, however, there is a technical limit to the highest redshift of clusters detectable via the SZE, which is set, for each survey, by the sensitivity and the beam size of the instrument. In order to sample the SZE efficiently, Planck is equipped with a suite of nine frequency channels that cover the electromagnetic spectrum both below and above 217 GHz, with one of the channels centred exactly on the transition frequency. Such a complete spectral coverage makes Planck an exceptional hunter of galaxy clusters up to a redshift z~1. Planck and XMM-Newton images of the newly discovered supercluster PLCK G214.6-37.0, composed of three sub-structures and located at a redshift of z~0.45. Other tools to study galaxy clusters are X-ray observations, which are sensitive to the so-called bremsstrahlung radiation produced by the hot gas in the ICM, and optical and near-infrared observations of the cluster member galaxies. These data can be combined with observations of the SZE in a multi-frequency approach, yielding a complete and thorough view of galaxy clusters and allowing astronomers to estimate their physical parameters, which are, in turn, extremely important for understanding how matter is distributed throughout the Universe and how cosmic structure formed and evolved.